Stanczyk is stuck on Pacanow. So I thought I would collect the metric statistics for all events (Births/Marriages/Deaths — Ur./Mal./Zg.) and individuals from the marriages. On marriages, I wanted to figure out how many times a person was from outside the parish. On all events, I wanted to know how many of each per year and the totals, plus the net growth (Births-Deaths) of Pacanow population (catholic). I also hope that someone from Poland a genealogist or a resident of Pacanow or an archivist can answer one question: Is there any existing metric data for Pacanow before 1875? It would also be nice to know why, if there is no data or where if there is data. 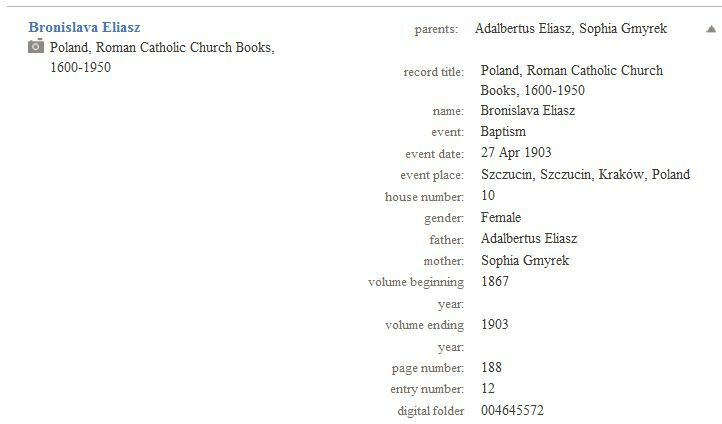 A neighboring parish, Biechow (my grandmother’s parish), has the same data available online from the National Archive (AP), but has data from late 17th century (w.) up to about 1850 (from Diocesan Archive – AD). Again why is there a gap between 1850 and 1875 in Biechow in the AD/AP data? Why is there no record of Pacanow data in the Diocesan Archive (AD)? One of the difficulties of locating records or data on a Polish (or Czech, Russian, Lithuanian, Ukrainian, etc.) ancestor is the many ways a name can be spelled, misspelled, mistranscribed, indexed, etc. in a database. This is why you have to be creative when trying to locate your data. Those are the ones I have found so far. That is 47 combinations! Now admittedly reading the handwriting from those ship manifests is difficult even when I am pretty sure what is being written; So I can feel for the transcribers / indexers who harvest the data and do the data entry into some database. Now, no searching by American Soundex, Daitch-Mokotoff Soundex, or even Beider-Morse phonetic matching or even using wild-card searches, not even if you had regular-expression searches (like Oracle databases have) would I have found all of those. I do not know what to tell you to do. Be creative and persistent. Look at adjacent letters on a keyboard (for mis-typings) as data is entered. Look for letters that are swapped (i.e. Eliasz vs. Elaisz) — mistyped or dyslexic. Just keep looking. I found ‘Bacanow’, because I said what might an handwritten letter ‘P’ look like to somebody? Of course, ‘R’ and ‘B’ suggested themselves to my mind. No ‘Racanow’, but sure enough out popped a ‘Bacanow’. So you never know. Now Stanczyk mentioned Pacanow, because I thought I was being slick and said, “What if I cannot think of all the ways a NAME can be misspelled?”. My answer was, “I know, I’ll just search on everybody coming over from the village of P-A-C-A-N-O-W.” Of course, as you might have guessed now I had a meta-problem because now I had to come up with all of the ways that Pacanow could appear. Well like the riddle, “How many licks does it take to get to the center of a Tootsie-Pop?”, I have an arbitrary answer … 47. I now have two spreadsheets. My first spreadsheet is my work-in-progress on the ZASUCHA of Niagara Falls SNA. The second spreadsheet I have is a rather large spreadsheet of all of the names from Pacanow (and truth be told Biechow, Piestrzec, Wojcza, …) and all of the surrounding villages that came through Ellis Island that I have found so far [plus a few mis-matches]. Every minute of Every day, you and I and the rest of the Internati produce data, big data in some kind of Internet colony. We email or blog or even a Facebook post or a 140 character tweet. Being genealogists we search databases and post trees with their connections and images like the 1940 US Census pages that hold our family members. And every day we post more data to the Internet. That is what the picture shows. The pace of Big Data is increasing too. Who backs up the Internet? Who archives the web? The “Wayback Machine” seems to record our civilization’s record so this work may last as long as Babylon’s cuneiform or Egypts hieroglyphs. Or will it? I know the Library of Congress is wrestling with Archival Issues of Digital works. What is the disaster recovery plan of a sun spot interference or another magnetic burst? Books will survive and be immediately available but what about digital works? How do we backup all of this data exlposion? Stanczyk was checking out the family search European Holdings for Slavic record counts / images to see what progress was made up through 2011. It is good if your heritage includes the Germanic peoples or locales which were previously under their dominion. Do not get me wrong. I am thrilled that there now over a million Polish records/images online or indexed at FamilySearch.org. We have the ability to better. Please consider volunteering as an indexer. You can start and stop and start again, your volunteering at any time. Find out more at indexing.familysearch.org. Every little bit helps. Stanczyk managed to do over 150 records this year. Genealogy is collaborative. Helping each other, we also help ourselves. Please pitch in — make this part of your Random Act of Genealogical Kindness efforts. Its a rainy day today and Stanczyk threw himself at the unfinished Survey Spreadsheet of his grandmother’s ancestral village: Biechow (old woj./gubernia Kielce). So I made a pot of coffee and I started at the highest level. My spreadsheet is for each of the years, 1792-1860 inclusive. So there is each year going down the leftside. I have each the three events: Birth, Marriage, Death (Urodzen, Malzenstwo, Zgonow) in separate columns. Please note in some years there are marriage banns (zapowiedz), so you may need to divide by three to get an idea of the actual number of marriages (round up to the next integer). The counts provided are the actual record counts in the church registers. For Biechow, I used LDS microfilm: 936660 .. 936664 inclusive (five film). Finally, I added a column of derived data, “Growth Rate”. This column is simply the number of births minus the number of deaths. Most years there is an increase. However, there are some negatives that show a population decrease. In one year (1831), I know for certainty, that there was a cholera epidemic. Hence a steep decrease in population in 1831. In other years, it may be pestilence/disease or it may be war or something else, but I have no info to explain the negative growth. Stanczyk got one comment recently. It was the first one I ever deleted. It was rude and was in reference to my rant at Genealogy Rankings posted by EOGN. Eastman, had just reposted some blogger’s effort without checking the results (a genealogical mistake — which we all make at some time or other). Stanczyk, however is a natural skeptic. So when I looked at the results and they differed from my experience … WILDLY. I knew they were wrong or at least that the methodology employed was flawed and the info was misinformation. So I searched for another more credible ranking — which I did find and repost myself. This info was more representative of the real world and while a methodology was also not documented for this, I did cite my source of data. I added FamilySearch.org, I knew this must be big! I added Genealodzy.pl which most people probably do not know (unless they read my blog), because it was a credible Genealogical Society Website (and probably not the most popular genealogy website in Poland). I added Footnote (now Fold3) — I was sure this was huge too. I also added CastelGarden, SteveMorse, and my own humble blog for reference — I am sure many other Polish Genealogy blogs are higher ranked. My additions are bolded and in RED. I could not compare my results to his results because he used the URL instead of the name so I am not certain which of mine are his and vice-versa. Also since we did these studies at different times, our results differ slightly in numbers. I am also puzzled as to how he got so many .UK or .CA websites. These did not get returned by my Alexa.com search — perhaps he limited his methodology or added in many websites that he knew. I think Alexa.com needs to return a consistent set of websites so rankings can be compared. I also think that some websites need to describe or META tag their website better so sites like Alexa.com and its competitors can do a better job of collecting statistics. I think GENEALOGY as a topic is MUCH more popular than Alexa.com shows. Also, perhaps Alexa.com data is NOT reproducible. So maybe my critique of EOGN is unwarranted and the Anglo-Celtic blog is also correct (as I am too). That would not be a good thing for Alexa.com. I wish other competitors in Web Analytics would publish a Genealogy/Family History Ranking study. I hope they include genealogia or other foreign renditions of the English ‘Genealogy’ so we can get a true World-Wide study. I also question whether Ancestry.com (and Ancestry.ca, Ancestry.uk, Ancestry.de, etc) should be separate or combined. When you view the rankings, the lower the number, the better. It means there are that many websites (-1) that are more popular. So for example, my blog that you are reading has 12.8 Million other websites (like Google, Facebook, Apple, etc.) ahead of me in popularity in the WORLD. Pay close attention to my additions, they are in bold/red and for the most part are near to the top. It is clear that Great Britain is much more genealogy crazy than the USA. If I were to do this again, I would probably go through my favorites/bookmarks and add in a few blogs (Polish Genealogy), Polish Genealogical Societies (US & Poland), FindAGrave.com, Interment.net, and Everett Genealogy Magazine. What would you add? 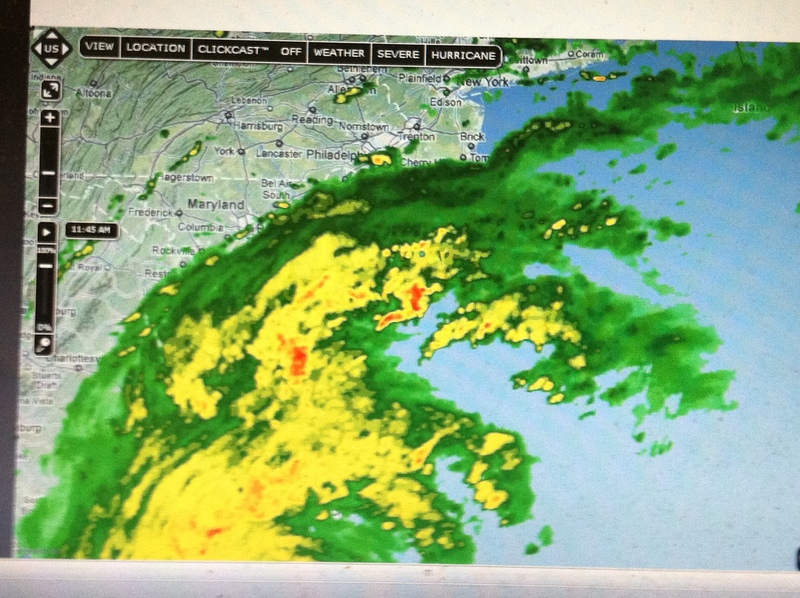 9:50 am Saturday Discovery.com allows you to track Hurricane #Irene. Watch for Periodic updates to this article to chronicle this storm from Stanczyk’s point of view. 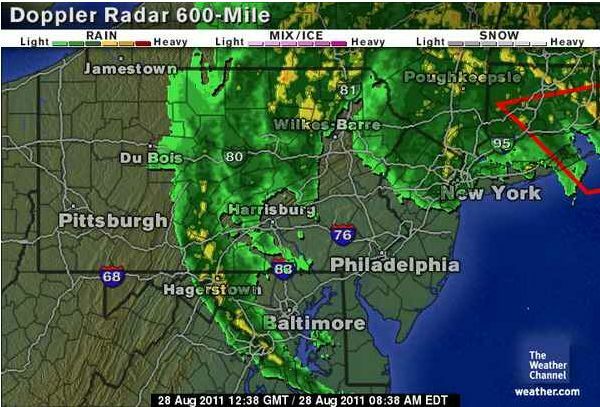 Today we should all crowd-source the chronicling of Irene, since somewhere between 10% and 20% of the American populace will be affected by Irene’s weather pattern. Are you game? This indicates the first bands are arriving in the Philadelphia area. 9:50 am Saturday Outside Window Photo. 11:52 am Saturday The Satellite photo shows that the outer band has reached Philadelphia. Well not much of a perceptible change outside from two hours ago, maybe a bit darker. I am hoping to determine the radar maps accuracy relative to me and my readings. Since Donna P. from the Blog, “Whats Past is Prologue” raised the question of media over-hype; Let me add a note. Yesterday’s Philadelphia Inquirer published a graphic showing #Irene ‘s projected route/timeline. I noted it said, Landfall (pretty close to where the actual landfall actually occurred) would happen at 14:00. The actual time of landfall was 07:30. The projected arrival was to be a day later in Philly. So I will see whether it arrives in Philly at 07:30 Sunday or not. All times are Eastern US timezone. 12:50 Saturday Previously in my comment to Donna P. I had said I’d compare to Hurricane Hugo (which happened in 1989). But I meant Hurricane Floyd in 1999 is the one in my mind that I wanted to compare. So it would appear that a Floyd comparison may be a sound benchmark to compare with afterall. 14:47 Saturday Well the rain started about an hour and five minutes ago (while I was at the supermarket 😉 ). It was busy and many items were sold out. The supermarket manager was heard saying what the contingencies would be if the power went out to his subordinate — so we are all preparing for #Irene. The Satellite now shows the forward band extended out past Philly and out all the way to Harrisburg — so I guess the rain should be happening (as I indicated the rain started about 13:42). My outside image is the last I will now be able to take from outside. The remainder will have be shot through windows. 18:00 Saturday If you look closely at the 18:00 Satellite image you will see that the entire Eastern Seabord from North Carolina to Connecticut is now covered by Hurricane #Irene or its bands of rain/wind.You can now see all Harrisburg again so the cone up here seems narrower while more completely covered. In fact the bands are now indistinct — just seems to be one great big mass of rain — less wind then in most of our thunderstorms. Here by me the region has 5 flood warnings and one Tropical Storm Warning (Irene is supposed to be slower up here and this far inland from the coast) so it will lose Hurricane status when it does arrive here. Well the weather outside has not changed much — still rainy. The Temps are fluctuating up/down a degree or two. No image of the outside this time [same as before but darker as we approach dusk]. Temp: 72 degrees Fahrenheit although it had dropped as far as 71. 19:34 Saturday No new Satellite image. 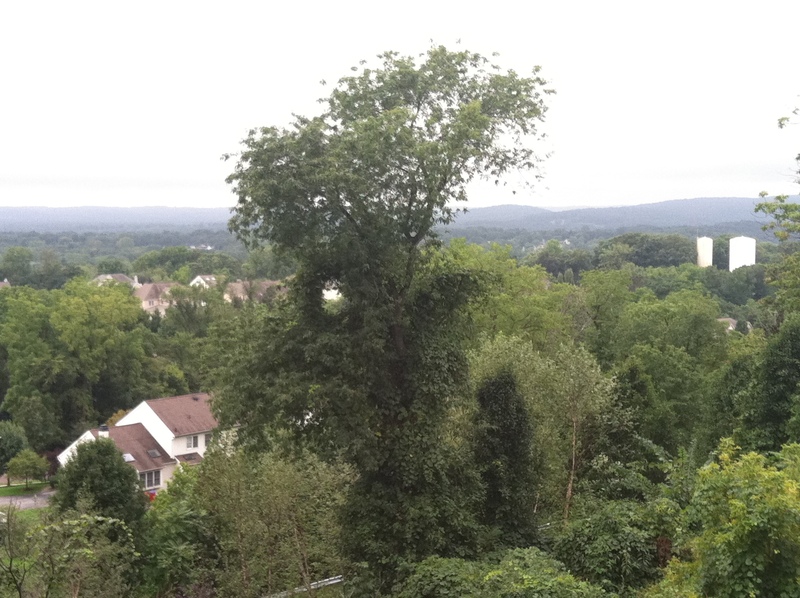 Hurricane #Irene is moving slowly. It is about Newport News, VA (partially offshore. Here by me the region now has 6 flood warnings and one Tropical Storm Warning . Darkness has descended and the weather outside has changed only slightly — still rainy. The Temps are at projected low (71 degrees). Rain Total: 0.72″ [inches]; Wow quite a change in 90+ minutes it more than doubled. 21:21 Saturday No new Satellite image. 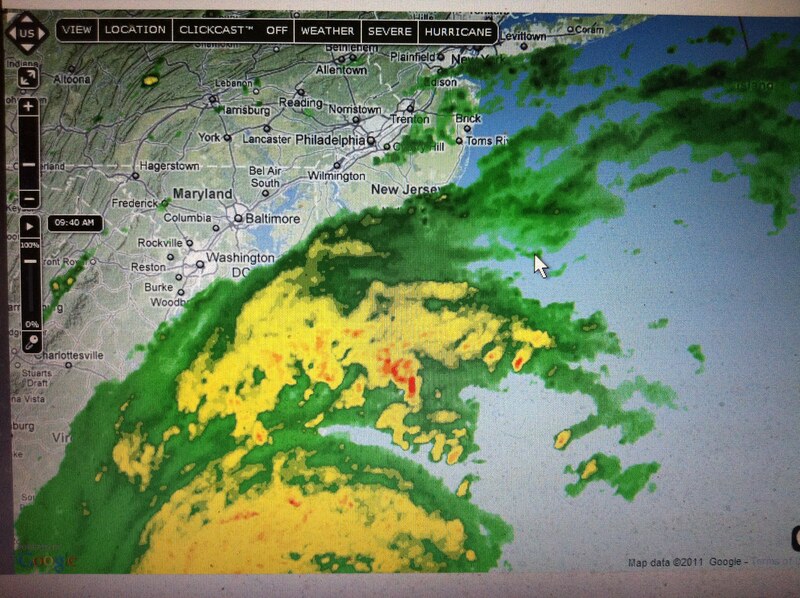 Hurricane #Irene is moving slowly. It is about Newport News, VA (partially offshore. Here by me the region still has the same 6 flood warnings and one Tropical Storm Warning . Rain Total: 1.12″ [inches]; In less than 60 minutes we added 0.4″ of rain to the total. Wind: 4-15mph[most of evening we have had gust in 20+ mph range]. Now we have mostly double-digits wind speed though it seems awfully variable. Data Collector is not realtime so I have not seen the gust speeds, but I have heard them outside. Temp: 70 degrees Fahrenheit. 1 degree below earlier predictions. 04:19 Sunday No new Satellite image. Too early for that rigamarole. Lats night, shortly after sign-off we lost power twice in quick succession, both outages very short in duration. Kudos to PECO. Let me see what data is still available to be shared. I have not yet turned on the TV. The very fact we have power and a connection to the Internet is a blessing. Moja zona and our dog Java are safe and sound so far — Thanks be to God. Wind: 5 mph. 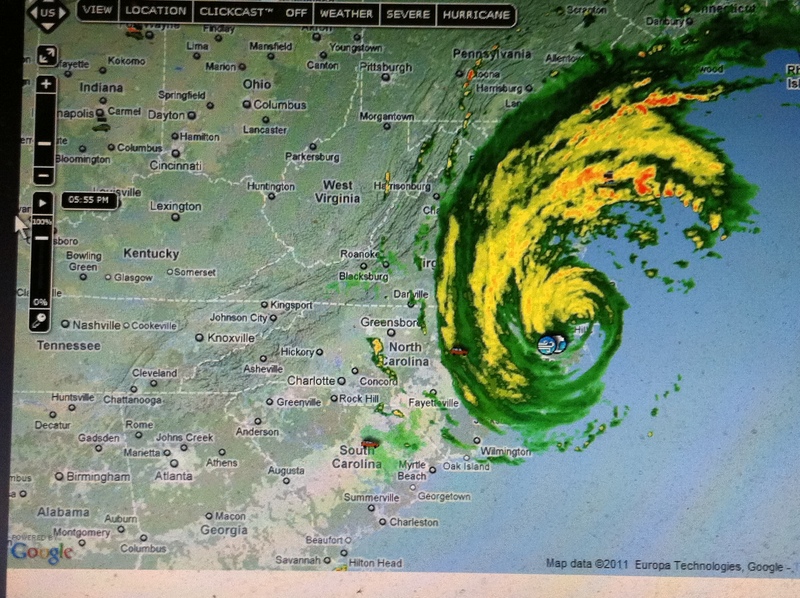 I can only assume by such low wind speeds that #Irene ‘s eye must be near my location. Next update will occur after I collect some data. Possibly shortly. So far the effects of Irene seem to have been exaggerated, except for that period when we lost power for a few minutes. I am leaning to media and government over-hype — This is not as bad Floyd so far. 05:08 Sunday No new Satellite image. Too early for that rigamarole. Tornado watch just expired (uneventfully) for my area. Picked up another flood warning overnight so we still 7 flood warnings and 1 tropical storm warning in my area. 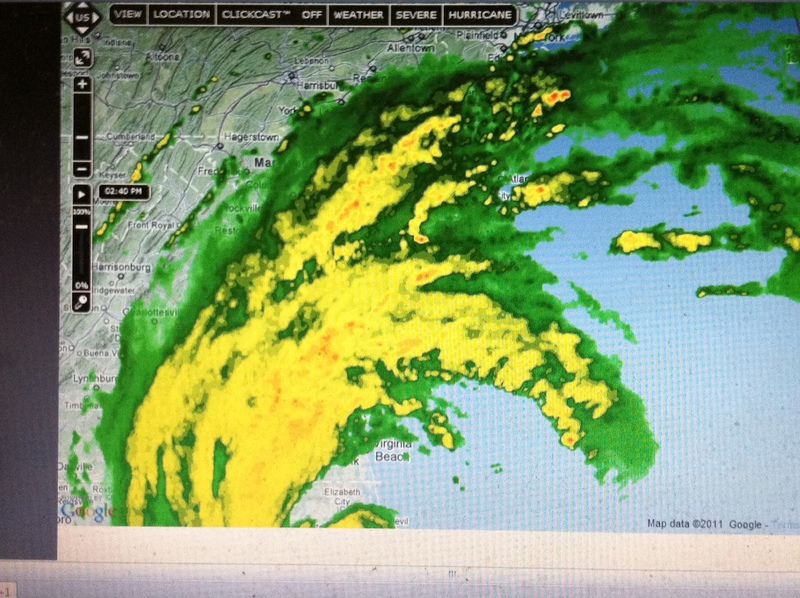 I was correct that the eye of #Irene is about Atlantic City, NJ (which east and a bit south of Phill). So that explains the relative slow winds speeds I am seeing/hearing. It appears that Irene’s greatest affect have been at the shore and the further inland you were the better off you were wind-wise — flooding has been worse inland. Storm surge at the shore is bad and especially so during the high tides. Irene being so slow, that two high tides can occur. during the event horizon. So Shore flooding and beach erosion have been problems –hence the necessity of evacuation orders. Still it seems more people have died from falling trees or tree branches — why are you outside? One of those fatalities was actually indoors. Rain Total: Yesterday’s rainfall total is yet unknown. Sunday’s total to this point: 0.46″. An impressive 0.18″ increase in less than 1 hour. They are calling for 1-4″ (two sources: one says 1-2″ more and the other says 2-4″ more). Best I can determine is that 1.88″ fell yesterday in my area. Do not know the accuracy of that as I suspect it was higher as we were getting about 0.40″ inches an hour when I stopped recording yesterday night and it was accelerating still. Wind: Variable 5-13 mph. Eye near my location. Gusts into the 20’s though I have heard them my data collector has not measured them (due to it not being continuous I am sure). Temp: 70 degrees Fahrenheit. It appears we have been in the 70-71 degree range for hours now — fairly cool for this time of year. It is a 15-19 degree drop since the weather pattern entered the area. 08:58 Sunday Satellite image shows that #Irene has left town; Uneventfully for my area. We still have 7 flood warnings in my area. The flooding will continue throughout Sunday as water flows down from the North down the rivers and bays back into the ocean. The local TV and emergency responders say that this was not as bad as Floyd [so even others are comparing Irene to Floyd]. A final note: We lost power a 3rd time since my last post but only for a few minutes. Rain Total: Yesterday’s rainfall total was 2.98-6.33″ depending on source. Sunday’s total to this point: 0.98″. Most sources say 2-4″ are likely for Sunday. We are way past the rainfall record books for August in history of Philadelphia area and we still have three days to go after today. Wind: Variable 6-10 mph. Gusts into the 30’s though. It looks like a trailing band [down in Baltimore] will still bring some more wind until Irene fully clears the greater Philadelphia area. Temp: 67 degrees Fahrenheit. That is fairly cool for this time of year. It is over a 20 degree drop since the weather pattern entered the area. Blessings and Thanks to God for my good fortune. Things could have been much worse and I had little time/resources to prepare/protect my family from this disaster (#Irene). was very sleepy/tired when the last posting was written! As I looked at this Social Network Analysis (SNA) that I performed and the resulting diagram from the data I realized two more things. There were five old men, the pillars of this Social Network who were the progenitors of this data, if not literally, then at least figuratively. These august gentlemen, were Marcin Elijasz (about 1819), Pawel (abt. 1825) & Antoni (abt. 1830) [undoubtedly brothers] Odomski, Antoni Wojtys (abt. 1823) and Franciszek Zwolski (abt. 1823). In fact, Franciszek Zwolski & Antoni Wojtys were the witnesses at my 2great-grandfather Marcin Elijasz ‘s death in 1879. If you have one of those five men in your family tree, then welcome, for we are surely relatives. Indeed it is true for just about everyone in the diagram. Second, this SNA diagram – that messy scribble from my last posting, with the nodes and the connecting lines is properly viewed in two ways. First off, the SNA diagram is a road-map for reading these church records (in Pacanow and to some degree the adjoining parishes) and providing a much richer/complete context for understanding the families: Elijasz (Heliasz), Zasucha, Wojtys, Zwolski, Odomski, Siwiec, Paluch, Lewinski, Piotrowski and Major and Wlecialowski. However the SNA diagram is a bit unwieldy in being able to quickly read/find any single individual. So the Second view is that it is a database. Now Stanczyk is database architect and data analyst by trade. So I will reorganize this data from its visual representation into a more “tabular” data friendly representation that is searchable/sortable. I will also redraw the diagram and organize its visual presentation because that visual road-map is invaluable. It is easy to count the hops between nodes (people) and get a sense of connectedness or remoteness between two individuals in quick fashion. I urge people to incur the pain of producing such a diagram and then re-viewing your church records and/or family group sheets again. It also shows the clear import of transcribing witness names and AGEs, as well as the mother and father’s ages and the God Parents names. It is too bad that the GEDCOM, file format of our family trees, mostly buries this info in NOTES/COMMENTS because it is hard to query/report/analyze these pieces of data that link/glue nuclear families together. My family tree never indicated to me that it was important to take note of the ODOMSKICH. Nor really the Zwolski or Wojtys and certainly not the Zasucha. The Lewinski and Piotrowski were not even on the radar before. 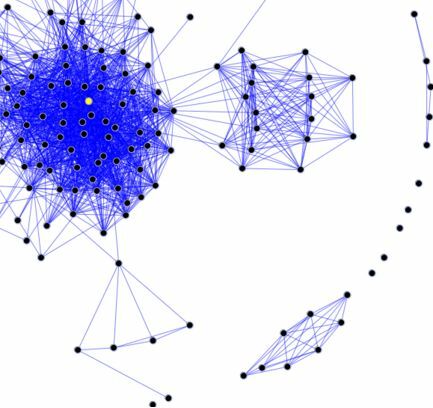 The SNA diagram really shows the rich/complex tapestry of the social network in Pacanow for my ancestors. You have a father, a mother, a baby, 2 wtinesses, 2 God Parents (sometimes more) [in birth records], 2 sets of parents [in marriage records]. So here are my family names that I am working with: Elijasz, Zasucha, Paluch, Odomski, Wlecial, Miklaszewski, Zwolski, Major, Wojtys, Siwiec, Piotrowski, Lewinski, and my discarded names ( Grudzien/Grudnia, Poniewirski, Janicki, Pytka, and Kordos). The surprises are that I needed to add Piotrowski and Lewinski and that I had to discard Janicki. We had no family knowledge or record of Piotrowski or Lewinski and I did have knowledge of Janicki (various spellings). Now dropping a name means less work. But adding a name means going back to the beginning and searching for them too. A lot more work. Early on I have already found a new female (Tekla Elijasz) relative under her married name (Wojtys). So there is some fruit. But I can see some foreshadowing from the research already. First off my research is already predicting two new siblings(Ludwik and Petronella) for my great-grandfather Jozef Elijasz (as I suspected), one person inconclusive,(Franciszek) and the new TEKLA is an issue. If she is truly a new relative then she is most probably a sibling of my great-grandfather. However, there is another TEKLA in that era (although the birth years are 3-5 years apart) and the looseness of ages in the Polish church records is presenting a challenge. If TEKLA is the exisiting TEKLA, then the research is telling me(predicting) that my great-great-grandfather (Martin Elijasz) has another brother Gaspar/Kasper. The age of the “new” TEKLA fits in the gaps of my great-grandfather’s siblings so I cannot eliminate her on that basis. In fact the ages of all the “new” predictions seem to fill in the gaps of my great-grandfather’s siblings. One of my candidate relatives also has church records in the adjoining Biechow parish, so I will need to look at her family name (and the new Tekla) in those parish records too, so more of my research parameters are being tweaked. I also had a finding of one social network dot having a Kalucki God Mother. Now this Kalucki is exceeding rare in the records I have access to. My Kalucki fixation is because my grand-aunt Genowefa Leszczynski married a Kalucki (source from an obituary of my grand-uncle Michael Leszczynski). Also, the lady in Poland who sent me my grandparent’s marriage records (Elzbieta Heliasz Kapusta) has her great-grandfather showing up in my research and he is connected to some of the same families she mentioned (Siwiec, Zwolski) and I know Wojtys from American relatives of Elzbieta. So once again another reconfirmation that Heliasz are really Elijasz (and both are really ELIASZ, i.e. that all three are the same family name) . My goal was to “prove” if some ELIJASZOW in Pacanow were siblings of my great-grandfather or not. My problem is that I have incomplete information so I cannot prove anything conclusively. But I have a few theories that I want to test. Whatever I find, I will use to test against archive data in Poland and see if my theory pans out or not. Can this technique predict familial relationships or not? Years: 1878-1884 [that is all I have to work with]. That is seven years. Even with ONLY seven years, I cannot read every record. There on average 190 births per year and all records are in Russian (Cyrillic character set), old style (pre-1918 reform) characters in abundance, and there are handwriting/paper/image/mistakes issues in the priest’s writings to deal with. Index Issues. My favorite is the inaccurate index (missing data or wrong name or wrong record #). Select some family names that have an affinity with ELIJASZ and chase just those records. Prove a connection to the children of Marcin Elijasz & his wife Anna Zasucha ( at present I KNOW of Jozef, Martin, Katarzyna and Jan). My candidates are Ludwik and Franciszek and Petronella Elijasz. Are they siblings of the KNOWN children? My focus is on ELIJASZ and ZASUCHA, but I decided to include other family names that connect through wives or husbands that marry into ELIJASZ family of this era. As my study proceeded, I added/subtracted some families as I collected data (or didn’t as the case may have been). Give me a week to collect data and build a chart showing the social network connections (and re-arrange the chart a time or two). I did a quick check of the FamilySearch database (#2 above) and found 31 exact or close matches to Eliasz. When I clicked through the list I found they had data from Szczucin parish (which is Austria-Poland) partition. In fact I am fairly certain the Szczucin Eliasz are distant cousins as this is just across the bridge (over the Vistula river) from my other Eliasz / Elijasz / Heliasz. I looked up the microfilm for Szczucin for 1867-1903 it is LDS Microfilm # 1898357. This matches the Szczucin in Brian Lenius’s gazetteer: “Genealogical Gazetteer of Galicia“. To recap, please look at Stanczyk’s little graphic. We have covered genealogyindexer.org, Poland’s Digital Libraries (Biblioteka Cyfrowa), and now number three in our series: Mapa.Szukacz.pl . 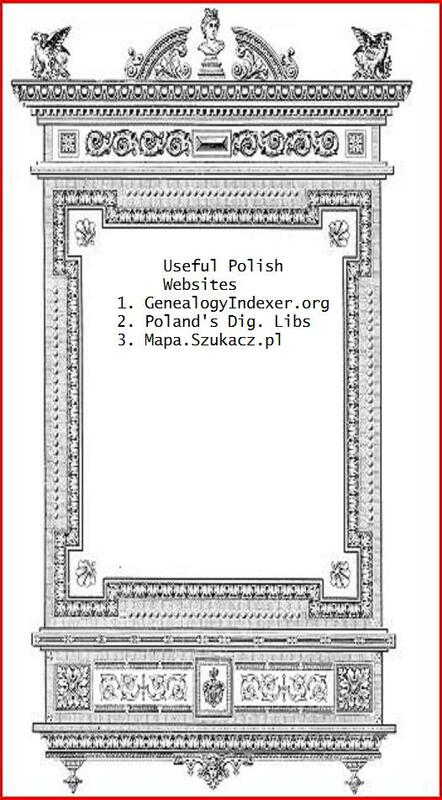 If you want to trace Polish genealogy a good many skills are required of the researcher. The ability to read a map or a gazetteer is critical. Where is Babcia’s village? So mapa.szukacz.pl is good for locating today’s existing villages/towns/cities. If you use Google Maps, then the basic concept should be familiar to you. But Stanczyk likes mapa.szukacz.pl because you lookup the village. To lookup a placename you enter the village in the field with the title ‘Miejscowość’ in the pink dialog box with the title, ‘Pokaż na mapie’ (‘Show on Map’). Finally, you press the button named, ‘Pokaż’ (Show). That is it. The village appears, assuming it still exists and you are fortunate enough to spell it correctly. If the placename you entered is a common one, then you may see a list of choices to examine and pick from. That is it and you have located dziadek’s (grandfather’s) home town. Of course, you have probably done some extensive research to get to this point. But now you have the lay of the land of your ancestral village. The radio buttions by ‘Zebliż’ change the zoom of the map; so adjust to your needs. All this is well and good and mostly just like Google Maps, except the ability lookup by name. But there have been a few new tricks added to this wonderful tool. It already gave you the population (ex. 1275 osób, like for Pacanow). You need not enter the diacriticals. It also gave you woj. , pow. , and gmina. Which you may think of as state, county, and township/borrough. Write these down, you will need them over and over again. Sadly, these levels of administration have changed since your grandparent’s time. You also get a postal code and telephone prefix in case you seek out family in the mother country. If that were all it would be a useful tool. But as I said, they have enhanced this web application. There is a valuable drop down named, ‘Przydatne punkty’ (“Useful points’). It only allows you to pick one selection. I find ‘kościoły’ (Churches) and ‘cmentarze’ (Cemeteries) the most useful to a genealogist. A word to the wise. The symbols that pop-up on the map (if any, at your zoom level) are woefully incomplete. So the church you are seeking may not show, as in my case. But I am hopeful that they will keep adding to his valuable resource. This option is akin to that of ‘search nearby’ in Google Maps. Originally, I did not use Google Maps for Poland or Ukraine because it was woeful in listing villages and its ability to search nearby was no good for countries that did not have English as their primary language. But I see today that those issues have been resolved by Google. But Mapa.szukacz.pl still gives you the population and administration levels and other demographics that Google has yet to provide. Stanczyk does have to praise Google in one way. The ‘little yellow man’ that you can place on most US roads to get a web-cam still panoramic view of the location is replaced with little blue ‘dots’ where you can drop him and see photographs from that spot (Which Pacanow seemed to have many). So I guess you should use both maps.google.com and mapa.szukacz.pl to geo-locate your ancestral village. To get the spelling correct, perhaps you can use JewishGen’s (also now in ancestry.com) Shtetl Seeker tool to help you get the spelling correct. Alas, that is another useful website for another day…. Beszowa, Busko, Chmielnik, Gnojno, Janina, Dobrowda, Drugnia, Kargow, Koniemloty, Kotuszow, Ksiaznice, Kurozweki, Lisow, Nowe Miasto Korczyn (Nowy Korczyn), Olesnica, Ostrowce, Pacanow, Piasek-Wielki, Pierzchnica, Piotrkowice, Potok, Sedziejowice, Solec Stopnica, Strozyska, Szaniec, Szczaworyk, Szydlow, Swiniary, Tuczepy, and Zborowek. Stanczyk has seen microfilm on many of these parishes or seen ancestor surnames in many of these places at the genealodzy.pl website. Anyone else from here? Yesterday, Stanczyk was extoling the virtues of the Genealogy Indexer web site. This site has OCR’ed Historical City Directories from Poland’s Digital Libraries and built a database of names from this OCR work. I also recommended Americans not use diacriticals (accents) unless you can use them correctly as incorrect use will cause you to miss records. Using correct diacriticals or none gives the same results, so mis-used diacriticals is the only way you can miss data. So do NOT use diacriticals. The image above shows the query screen, where Stanczyk queried on ‘pacanów, eljasz‘, using the keyboard symbol next to the query field to enter diacriticals (I know some of you will want to do this despite my admonitions otherwise). This is actually a handy tool for entering Cyrillic or other Slavic characters on our USA keyboards. Just cut/paste from this website to another website or form or document. At any rate, my query returned five results (only three shown above). I chose the second one to illustrate in this article. The links will take you to a digital image of the document (using Deja Vu browser plug-in) that matches your query result. How cool is that? So I selected the second link (1930 above). The resulting digital image was a City Directory Phone book. The language is Polish, but there is a second language (French) too! So if the image is unreadable in one language perhaps you can read the other and figure out what was unreadable in the other. It is also helpful in translating too, to have two languages. The first part is a description of the place-name (like a Gazetteer) written in both Polish and French. The top two paragraphs are Polish, then French Gazetteer description of the place-name (Pacanow). We can see that 1930 Pacanow had 2598 residents an interesting fact to know. After these first two paragraphs we see, what we would call “Yellow Page” listings by business type. It starts with Doctor(s) (Lekarze) and then from there on it flows alphabetically (in Polish) with Midwife, Pharmacy, etc. Each business type is followed by one or more names. These names are your putable ancestors. I was interested in Kolowdzieje (Wheelwright) business Eljasz M. [This is possibly my grandfather’s uncle Marcin Eliasz]. Also the Wiatraki (Wind Mills) business was VERY interesting because we find both Eljasz and Zasucha names. Now this makes Stanczyk’s day as my 2nd great grandfather was Martin (aka Marcin) Elijasz and he married an Anna Zasucha. These Wind Mill owners are very likely close ancestors of Stanczyk. 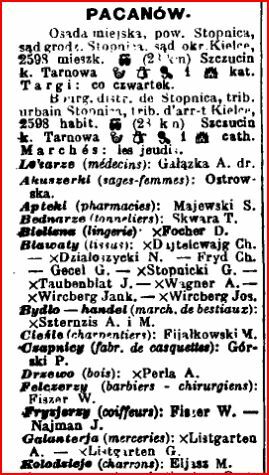 There are many surnames from my family tree besides Eljasz and Zasucha, we find: Poniewierski, Pytko, Siwiec, Wlecial, and Wojtys. Now I can put an occupation by my ancestors. Nice. Very Nice! Stanczyk wants to collect under this continuing subject line good URLs / links to websites that provide very good to excellent Polish Genealogy data or possibly reference materials for genealogical research. This first website (URL) is one I wrote about in the Polish Genealogists LinkedIn Group (here) back in October 2009. Its name is Genealogy Indexer . Back in October, 2009 they had: 77,000 pages of historical directories (business, address, telephone, etc. ), 28,000 pages of 64 yizkor books (memorials to Jewish communities destroyed during the Holocaust). Now 20 months later they have: 141,000 pages of historical directories (business, address, telephone, etc. ), 28,000 pages of 64 yizkor books (memorials to Jewish communities destroyed during the Holocaust), 11,000 pages of lists of Polish military officers, and 17,000 pages of community and personal histories. That is an +83% increase, so we can say this is a very active website/database to add to your bookmarks/favorites. PLEASE take note they list what page # (usually on a digital book from a Polish Archive/ University) you need to look at in their search results. Stanczyk personally loves those digital books/documents made available online by Polish Libraries and Archives. I have already had some successes. They OCR’ed these digital resources and built indexes — very nice! For example I searched on “Pacanow, Eljasz” to find ancestors from ancestral village of PACANOW. You do NOT need to supply diacriticals (like the slahsed ł ) — so notice in the ‘o’ in Pacanow does not have the accent ( ó ) on it. It also worked for “Pacanow, Wlecial” — where I do have a slashed ł at the end. The results were identical whether I used the diacritical or not. Being an American, I liked the convenience of not having to type (or cut/paste) a diacritical character on my searches. You do need a browser add-in called Deja-Vu (.DjVu plug-in) to view the actual image associated with the OCR data. I use Historical City Directories for my American ancestors. Now I can do the same for my Polish Ancestors too. A big thanks to genealogist Logan Kleinwaks for providing this excellent Polish (Catholic and Jewish) genealogy resource ! Metal Id Card ? ? ? Stanczyk has a question for the vast army of Genealogists out there on the Internet. 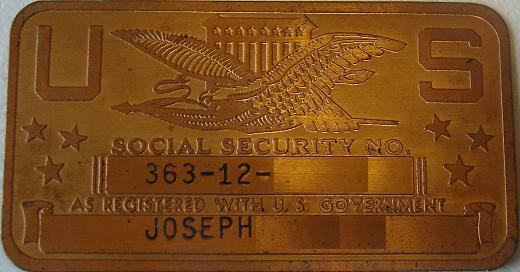 Today’s blog has a picture of my deceased grandfather’s social security card. This card is brass (I think). Here’s the question: Did the U.S.A. ever issue metal social security cards ? Does anyone else have a metal social security card ? Does anyone else have an oddity from an ancestor that you are puzzling over? Send me your comments and pictures. The May 2011 Smithsonian arrived recently. In it was an article by James Gleick on Memes. This is the same Gleick who in 1987 wrote: Chaos: Making a New Science, and who has a new book this year called: The Information: A History, a Theory, a Flood. In fact, the Smithsonian article is adapted from that book. 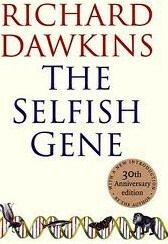 The word, meme was coined by Richard Dawkins, in his 1976 book, The Selfish Gene (see page 192) . So this article is a meme upon the venerable meme, a kind of meta-meme, which I will coin as: meme-meme. Dawkins defined a meme as, ” … a name for the new kind of replicator, a noun that conveys the idea of a unit of cultural transmission.” Dawkins said the analogy was: Cultural Transmission = Genetic Transmission. And so by Dawkins’ utterance, a meme was born (created). He said it sounded vaguely like gene, rhymes with cream, and might even conjure to mind the word memory. So we have gene, cream, memory as the Mnemonic device for remembering the word meme. He originally wanted to use ‘Mimeme’, but then decided upon a monosyllabic word (how atomic) meme. However, this jester thinks, Dawkins writings and ideas are all about, ME, not my me, but his (Dawkins’) me. Notice how meme is a self-replicated version of the word ‘me’. Hence, my meta-meme is meme-meme; So it naturally follows that it is all about me and he (my me first, then his me). Well it was defined in the Selfish Gene (uh Meme), so perhaps, me-me-me-me should be an understood pun? Stanczyk does not know, having never met Dr. Dawkins and thus unable to pose the question. If a Hula Hoop is in the woods (without anyone around to hear it) is it still a meme? What if there is also a child in that woods? How about we add an Ad-Man? But still with only a child and Ad-Man to witness it perhaps there is no cultural transmission. Perhaps we need to add another child to watch the first child play with the Hula Hoop — are we getting anywhere near a meme yet? If so what is the meme: Hula Hoop, child (1st), Ad-Man, child(2nd), watching a child play ? Is the dark matter between the two children the meme — some kind of quantum cultural transmission? Perhaps we need a TV to broadcast the the two children in the woods to other children (elsewhere) to have a meme. Is the TV or the broadcaster the meme; perhaps it is the commercial being broadcast that is the meme? And who was meme creator? What if the other children did not want to play with the Hula Hoop; Would the concept of a Hula Hoop have been a meme, would these articles still be meme(s)? When are two memes sufficiently alike to be considered the same meme? Why did the Journal of Memetics become extinct and yet the venerable meme (not to be confused with my meme about the meme) continue to live on? Please keep the meme alive and also my meta-meme (aka meme-meme) alive and tweet and re-tweet this article. Share it on Facebook with your friends. Write about it in science Journals. Send it in emails. In order for me to ensure its survival I am including the hash tag: #Viral. For God’s sake save the meme (and the meme-meme), just like the Whale, snail-darters, and Yellowstone Wolves. A Meme is a terrible thing to waste — Pass it on. Thank you for reading my theme (uh meme, uh meme-meme). I am hopeful that some other blogger or writer or researcher will write about my meta-meme (aka the meme-meme) and create his/her meta-meta-meme. I replicate therefore I meme. In the last week Ancestry.com has updated their iPad/iPhone App. In the prior release, I could never get the edits to work (i.e. to edit on the portable device) or to have the edits synch without error. I am happy to report that you can now edit on the portable device or you can edit on the Internet at the Ancestry web site. In both cases, it works and it synchs. I did find that editing on the portable device resulted in immediate or nearly immediate synch with the web site. Edits on the web site were slower to be synched back to the portable device. I am rather fond of the UI and find it is very usable even on the iPhone’s small screen. Now I may even leave the laptop at home when I go researching as I can bring prior research with me and even collect and edit the new research into my family tree. 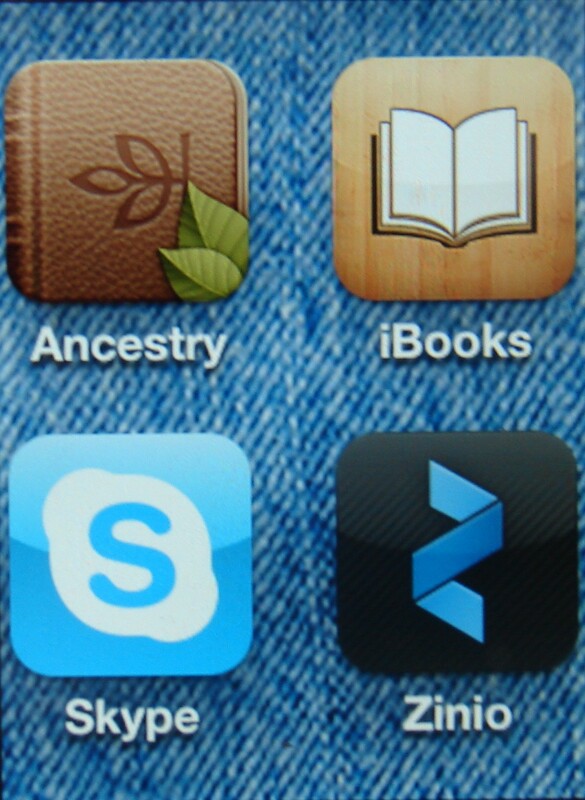 So now like Jack’s beanstalk, my family tree is in the cloud. This gives me easy access everywhere and a nice offsite disaster backup in addition to my portable freedom of bringing all my ancestors with me all of the time. Nice job Ancestry. I next hope I can try out the Mac software, Reunion, and get their Reunion iOS device App (when I get some discretionary income) to review. After that I will compare the two products side-by-side. Prior Review -> here . The Biechow parish Stanczyk keeps writing about was shuffled amongst many administration units that changed as the borders changed, which in Europe was often. After the partitions started in 1772, my ancestors were briefly in the Austrian partition. In the Napoleonic era, they were a part of the Duchy of Warsaw and were in the Departmente of Krakow. Post Napoleon, they were in the Kielce wojewodztwo of the Congress Kingdom of Poland. My ancestral villages pretty much stayed put after that point and were in Kielce wojewwodztwo or gubernia depending on the whims of the czar until about 1918. Today, they are in wojewodztwo of SwietyKrzyskie. The records were originally kept in Latin. The earliest Latin records were scant/terse, let me call them blurbs, like little Power-Point bullets scrawled upon the pages of the church books. Eventually they became more formulaic and I’d see what I call the Latin paragraph form (really a few sentences). 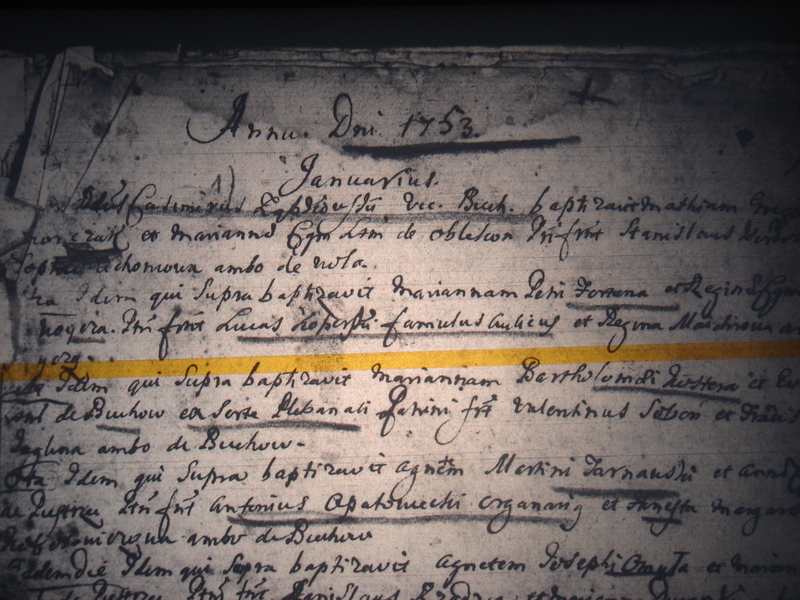 Copies would be made and shipped to the Archdiocese Archives and these were often recorded in the Latin Box form that was prevalent in the Austrian partition. Napoleon while he was briefly in charge, instituted a format according to the Napoleonic code, that was written in the lingua franca of each locale. So about 1805, we see the church records being kept in a Polish paragraph form (quite long) as specified by the Napoleonic Codex. In 1868, the Czar decreed a change from Polish to Russian, but the Napoleonic format stayed, so the records switched from Polish paragraphs to Russian/Cyrillic paragraphs. 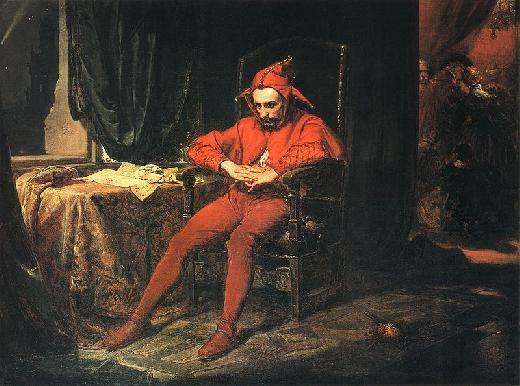 So this jester since he was forced to, has acquired the ability to read enough Latin to read the genealogical blurbs of Catholic priests and is quite skilled in reading the Polish paragraphs and is still increasing his knowledge of Russian paragraphs, but has long since been able to pick out the salient facts of the vital records even in Russian with Cyrillic character set (as opposed to Polish language written in the Latin alphabet). Now let me hasten to add, that this was true of Catholic church records. Obviously if your ancestors were Jewish, then you have additional burdens in your research, including reading Hebrew. The format of recording vital records also differed amongst the three partitioning / occupying Empires. Stanczyk writes from a Russian-Poland partition experience. Stanczyk’s eyes weary fast when trying to read these early Latin blurbs. Handwriting had not been perfected in those days. Also I find a good many misspellings on the family names or sometimes even the village names. This is still better than what was present in the 17th century. Each line starts with a day (month, year are usually assumed). These are really baptismal record (as opposed to birth), so it records the baptism, the parents and the God Parents of the baby and the villages of the people involved. Now here is where Stanczyk is looking for help. Please take a look at the next image (click on it to see a full size copy) and help this jester understand the concept of ‘alias’. 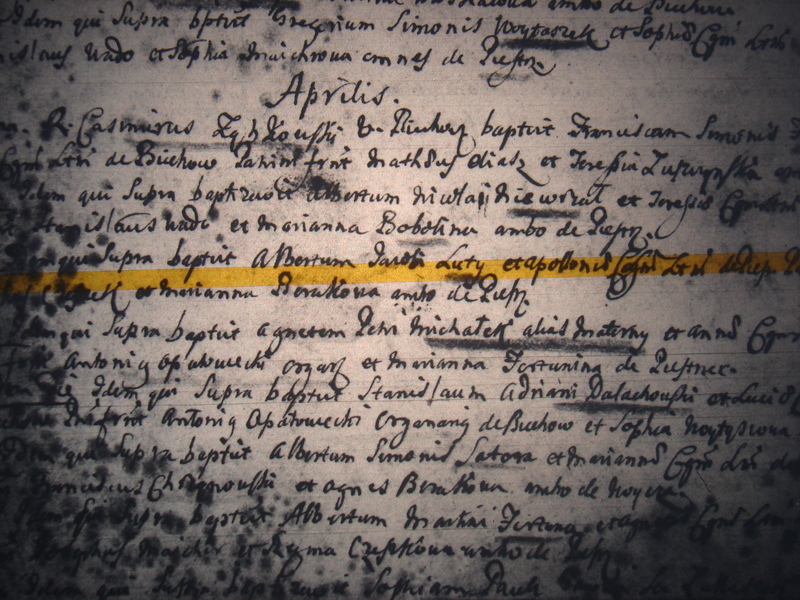 In this record we will see a surname of Michałek as an alias for Materna. Is this some kind of case of name “evolution”. The Michałek family name disappears and the Materna family name becomes a common village surname. Why would a surname become aliased? In these early Latin records, it happens a few times and Stanczyk is trying to understand what is happening and why? I do not know what to make of the data. There are years missing and the first year was the highest birth registration. 1831 seems to be an outlier with only 53 births. From reading in books, works in newsletters (like by Dr. Paul Valasek), and in my own grandmother’s parish of Biechow which is very nearby, I know 1831 to be a year of the Cholera epidemic. So perhaps an epidemic limited births (or at least their registration). Ludwinow, Oblekon, Parchocin, Swiniary, Trzebica, Wlosnowice, and Zielonki . One final note, this parish was in the old wojewodztwo, Kielce in this era (1826-1852). Stanczyk want to weigh in on WikiLeaks and the many tangents that a WikiLeaks article can take. I do not think Julian Paul Assange is correct; In fact I think he is breaking many laws and violating many standards of ethics. So US Supreme Court and US Attorney General Eric Holder listen up, so to speak. First off, making threats like, ‘Do this or else I will do this” is an act of extortion. When I listen to NPR or read the New York Times or Philadelphia Inquirer, or even when I watch Fox News, I do not get threatened that act against their news/journalistic articles, I will have to bear the brunt of some kind of blackmail. Not even Rush Limibaugh gives voice to such as that. So if WikiLeaks is journalism, why does it make extortionate and/blackmail threats? WikiLeaks and its supporters cannot espouse Free Speech and then attempt to deny the voices of other organizations via Denial-Of-Service attacks. That is thuggery to claim you deserve Free Speech rights, but then turn right around and deny others, their right to free speech on their web sites or in other endeavors. An awful hypocrisy. It also demonstrates a lack of understanding of Free Speech. American has had the right of Free Speech longer than any other nation. As such, it has had to deal with many nuances related to Free Speech. It has long been acceptable to outlaw, yelling “Fire” in a movie theater or even to remove people from said theater for creating a disturbance. Free Speech does not allow such irresponsible or reprehensible actions. Free Speech also does not extend to people who make Hate Speeches or to people who incite violence. Those are not examples of Free Speech. Do you not see the principle that “Free Speech” cannot deprive others of their rights/liberties and be considered Free Speech. Stanczyk has long been an IT worker. As such, data and information and the communication of such is governed by laws. These laws extend beyond national boundaries sometimes. Stanczyk saw how the latest “Cables” spanned such a breadth of data, that it covered many aspects of the human condition. For example, it was covered in sport news pages, because there instances of how Iran used sports to deal with internal political strife. Who would have thought that WikiLeaks would impact Sports? So too must there be data dealing with: HIPAA laws (privacy related to medical conditions), PI (privacy information and data) would seem to have been heavily violated. What about identity theft from WikiLeaks releases? Stanczyk likes his genealogy but also sees that Census data must be on ice for 72 years before being released to the public. So Free Speech and Freedom of Information has long had a defined context of limits. Finally, the last concept is IP (Intellectual Property). WikiLeaks received stolen property from soldier Manning (whose legal/ethic problems are even worse than WikiLeaks). Assange might not have realized that when he received IP from Manning and that Manning stole this “valuable property” from the US Government, he not only violated receipt of stolen property, and violations of espionage, but also clearly violated many aspects of the Digital Millennium Act (both civil and criminal). By failing to return said information when the property owner demanded it, it made the WikiLeaks organization as a whole (including distributed agents) subject to confiscation of computer and other technology. This is best understood by comparing this to what happened in the matter of Apple Computer and Gizmodo on the iPhone prototype. IP is valuable and cannot be willfully stolen or received and cannot be denied from its rightful owner. There are many corporate espionage cases of late that also demonstrate the severity of IP theft and the civil/criminal aspects that accrue from those actions taken. The many civil cases against Assange and WikiLeaks that come out of the distribution of data in violation of HIPAA, PI, or other identity theft matters and resulted in damage or losses of property or loss of life will keep lawyers around the world gainfully employed for a decade or more. Assange is learning too late, that Journalists have editors and legal teams to vet stories against laws and customs and matters of ethics. Journalists do not make threats. As Stanczyk sees it, the Electronic Frontier Foundation (EFF) and Russian Premier Putin have come down on the wrong side of this issue. Putin seems out of place for sure, when one considers how many Russian journalists have been killed. This jester has appreciated Mr Putin’s work with respect to Poland of late and has even written a note of consolation to Mr Putin when his nation has come under attack by terrorists, so it pains this jester’s Slavic soul to call Mr Putin out on this issue — just because Putin sought to lash out against the US in order to make points for Russia on the backs of this difficult issue. Time will tell on this matter.